This week on Riverdale the main characters at least spoke to each other. That might be the standard for a good episode at this point. The show revealed one person who’s been dressing as the Gargoyle King. It was Tall Boy, the former Serpent member. But, was any viewer or character really concerned with who’s in the costume at this point? The Griffins & Gargoyles plot seems to involve powerful forces strong enough to control multiple towns and even invade people’s subconscious minds. I have no idea why, at this point, anyone would treat it as a situation where they just have to find the culprit and stop him. The reveal highlighted the fundamental flaw of this season— it’s very unclear, on a basic level, what this conflict is. Is it a serial killer? Is it paranormal? Is it a crime syndicate? It seems to change at the show’s convenience. Meanwhile, someone shot Hiram Lodge. 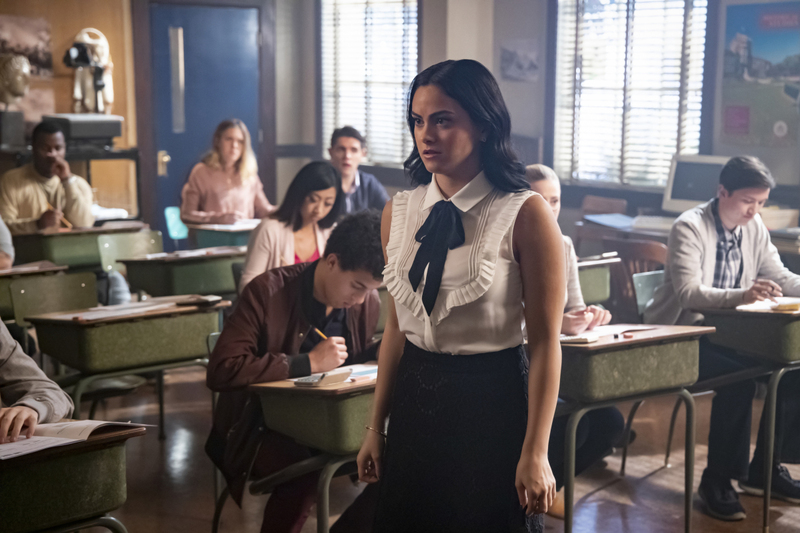 Veronica Lodge broke up with Archie Andrews because she thought he did it. It’s depressing we’re at the point where Veronica could plausibly think that Archie tried to kill someone. It’s also frustrating that Riverdale refuses to really define Hiram. A few episodes ago he was someone who was happily complicit in the torture of teenagers. But, in the past couple episodes it seems like we’re supposed to think Veronica could still care about him. There’s having a parent who’s complicated and then there’s having a parent who knew about a crooked mental institution/gay conversion camp and exploited it for profit. Hilariously, this episode also tried to have Archie actually care about school. The SATs plot was incredibly sloppy. There were obvious logic issues, like the fact that a bunch of juniors are feeling do-or-die stakes about the test. At one point Betty Cooper was threatened with the prospect of a 0 if she walked out. As if she wouldn’t have plenty of other chances to take it. Even without outside knowledge about how the SATs work, it was weird to use a standardized test for a plot that was exclusively about Archie. The focus was so much on him that it made no sense to not have it be a plot about him just trying to pass a class. I’d normally welcome a down-to-Earth actual high school plot, but this one was too sloppy to work. Meanwhile, Betty visited her father in prison so that Riverdale could copy the cosmetic aspects of Silence of the Lambs. Okay.